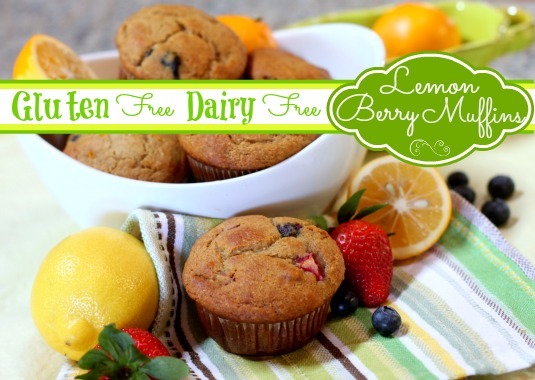 The season has officially shifted and it is time for a little Spring baking….and these Gluten-free, Dairy-free Lemon-Berry Muffins fit the bill perfectly and are just right for an Allergy-Free Easter Brunch. I’ll just mention that I may have already pulled out the flip flop collection from the back of my closet…although I probably have NO business doing so considering I have not done anything pretty with my toes in months. Anyway, with this warmer weather (that I promise am not talking about), I’m craving some flavors of Spring right now after our long winter…and since citrus and berries go perfectly with the warmer weather, I am all about using them in my baking these days. These Lemon-Berry Muffins are a hit in this house and my boys can put quite a few of these down at one time. The bonus is that they are full of healthy ingredients and will not give that sugar spike that a lot of baked goods can give. 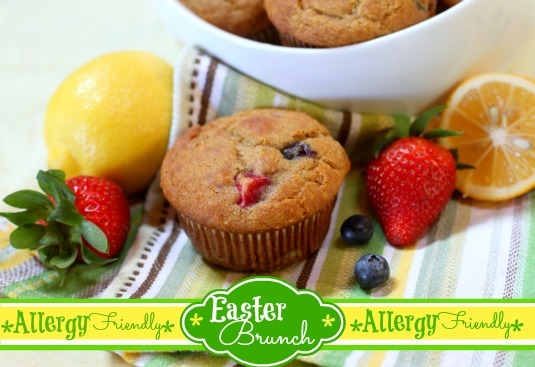 And with Easter sneaking up on us, these muffins would be a great treat for your Allergy-Free Easter brunch! NOW. Let’s add some Spring in your step and make some muffins! 1. Preheat Oven to 350 degrees. Line muffin pan with liners, or grease openings. 2. In medium bowl, whisk/mix together Almond Flour, Superfine Brown Rice Flour, Teff (or Oat) Flour, and Arrowroot Starch until light and airy. Add in Baking Soda, Baking Powder, and Sea Salt –whisk until blended and mixture feels light. 3. In large bowl, beat together Yogurt, Coconut Oil (or melted Butter or Earth Balance), Honey, Freshly Squeezed Lemon Juice, Vanilla, Lemon Zest, and Egg yolks (or Chia Gel mixture). 4. Slowly mix dry mix into blended wet ingredients. Gently mix together until just blended. Do not overmix. Then fold in berries gently. 5. (Omit this step if using Egg Replacer): In separate small bowl, beat egg whites until fairly stiff peaks form. Then very gently fold whites into assembled muffin batter until just incorporated. 6. Fill muffin wells 2/3 full. Bake in oven for 17-19 minutes, or toothpick comes out clean from center. Makes 16 muffins. Enjoy! I just want to dive into that photo and dig in. 🙂 I love that these are naturally sweetened, too. Thanks, Hallie! 😉 I love that they are naturally sweetened as well… makes me enjoy giving them to my kiddos as a little treat! These do sound perfect for brunch indeed- yummo! What a wonderful springtime muffin, Kim! I love all the colors in the photos, and the line up of ingredients looks great too. You have a great way of making amazing recipes. I love this. Hi Jackie, are you able to eat maple syrup? That would work well in this recipe as the sweetener. You can do the brown sugar, but because the honey is wet and brown sugar is dry, it will affect the wet to dry ratio in the recipe a bit. Kim, you make the best muffin recipes! These look amazing. Have a Happy Easter! So glad I spied these, Kim! The email notice must be buried in my In Box somewhere, so I’m happy I saw this post of yours via Iris’ feed. 🙂 This recipe is perfect for All Gluten-Free Desserts … All the Time right now, so I’ve got it featured. 😉 Thank you! No flip flops out here. I considered putting on two pairs of socks today. No kidding. What beautiful muffins, I can’t wait to make them!!! I’ll have to replace the teff and rice flour since I have to be grain free, but I’m sure they will still be delicious! I can have maple syrup, thank you so much!! !